"This two-ingredient icing goes together in almost no time, and dresses up plain brownies or a sheet cake. Use less yogurt if you want it to be thicker. This is ready to spread on a cool flat cake or brownies or can be used on a Bundt® cake, where it will run down a bit. It will harden in the refrigerator, so it's best to serve immediately or let your dessert reach room temperature before serving, but store any leftover in the refrigerator." Place chocolate chips in a microwave-safe glass measuring cup; heat in microwave, stirring every 10 seconds, until melted and smooth, 1 to 2 minutes. 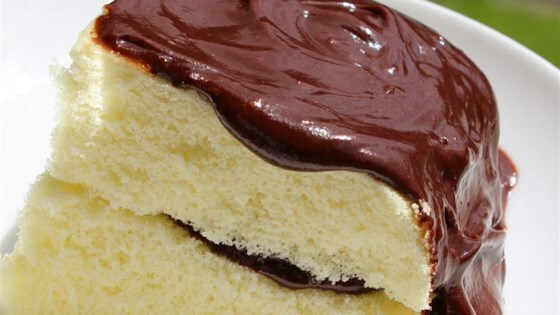 Stir yogurt into melted chocolate until icing is smooth. This was inspired by the wonderful sour cream ganache recipe by KatieMac on this site. I might try some other flavors of yogurt sometime, but this one worked for me. For example, you could use cherry yogurt and garnish the cake with fresh Bing cherries and whipped cream. Quick and easy and nobody saw me wolfing down that brownie covered in frosting while the kids weren't looking, right?! Sounds amazing, but I have never ever seen coffee yogurt? I live in a suburb of LA and have never come across it anywhere . . .